In traditional African kitchens, the pot serves as an essential tool for the welfare of the family. Girls fetch water from the river, mothers brew porridge for the younger children, and cooked food is stored in a pot. A home with a pot on the stove or full of stored grains shows that no one will sleep hungry. It is and was a symbol of well-being. It’s a cultural heritage. With expected wear and tear over the years, a pot will start to show cracks, letting some water or soup leak out. If the village potter mends a pot in time, it can be salvaged; if neglected, it will continue to deteriorate. The African pot as a symbol for African food security has been at the center of Africa Lead’s “Champions for Change Leadership Training” since Africa Lead I, starting in 2010. During training, participants fill the pot of food security to ensure their commitment to being Africa’s food security champions. With Africa Lead II ending in 2018, Africa Lead has undertaken sustainability measures in Kenya to ensure that the efforts of food security champions are passed to even more people and that Kenya’s pot of food security remains mended and filled. 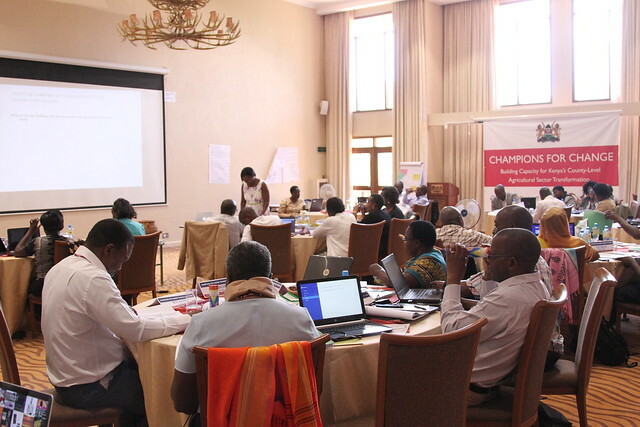 Africa Lead has established partnerships in Kenya with government and donor organizations to transition and institutionalize the C4C training curriculum. These organizations and donors have agreed to adopt the curriculum and cascade it to all 47 counties in Kenya. They include the Food and Agriculture Organization of the United Nations (FAO); the German Society for International Cooperation (GIZ); Kenya’s Agricultural Sector Development Programme (ASDSP), supported by the Swedish International Development Cooperation Agency (SIDA); and the Ministry of Agriculture Livestock and Fisheries. Speaking at the opening of the training, Shadrack Mutavi of GIZ described the workshop as a great milestone that will go a long way in addressing food security in Kenya through the counties. “Using the skills gained at the workshop, these new trainers will now cascade elements of the curriculum to the counties to ensure better county development plans are prepared in the new cycle of policy formulation,” said Shadrack. Over a week-long training of trainers workshop in March 2017, Africa Lead in collaboration with these partners facilitated a training titled, “Building Capacity for Kenya’s County-Level Agricultural Sector Transformation” for 64 participants from all 47 counties. The training imparted practical lessons on county coordination, sector planning, and evidenced-based planning including effective policy formulation, domestication, and implementation to achieve food safety and security for Kenya’s devolved agricultural sector. Chants of “fill the pot, mend the pot” rang throughout the training, reminding participants that everyone has a duty and role to play in promoting food security. Trainees who are now C4C facilitators will act as multipliers of the concepts within their counties. “We saw this as a great opportunity to take advantage of existing knowledge [C4C Training curriculum] and build on it, as it aligns well with ASDSP’s components of sector coordination, resilience, and social inclusion as well as value chain development,” said Kennedy Olwasi on behalf of ASDSP. The final day of the training focused on work planning, with each county team developing action plans to approach stakeholders in their counties and share knowledge gained through the workshops. This exercise ensured that the knowledge participants gained and the commitments they made were actionable. More importantly, it helped ensure sustainability of Africa Lead’s most heralded tool for food security and transformation of Kenya’s agricultural sector. From left to right: Mr. Shadrack Mutavi – Policy Advisor at GIZ; Mrs. Ann Onyango – Director of Agriculture at the Ministry of Agriculture, Livestock and Fisheries; and Mrs. Phoebe Odhiambo – ASDSP National Coordinator fill the African pot with grains during the Champions for Change Training of Trainers workshop in Naivasha, Kenya. Their collective effort to fill the African food pot symbolizes the role everyone should play in filling the pot of food security. Photo credit: Hellen Githakwa.